It's fall ya'll! Autumn is my favorite season. The weather is perfect for long jogs and leisurely puppy walks. Crunchy leaves, tall boots, hot beverages and ovens warm with delicious treats baking away. Clearly, there's lots to love. During the weekend, I wanted to eat something with pumpkin. It was a little cooler and the trees are changing color, so it's time to enjoy the best the season has to offer. This recipe was really easy because I took some help from cake mix. With just two ingredients, I got a perfectly puffy and airy season-appropriate cookie. 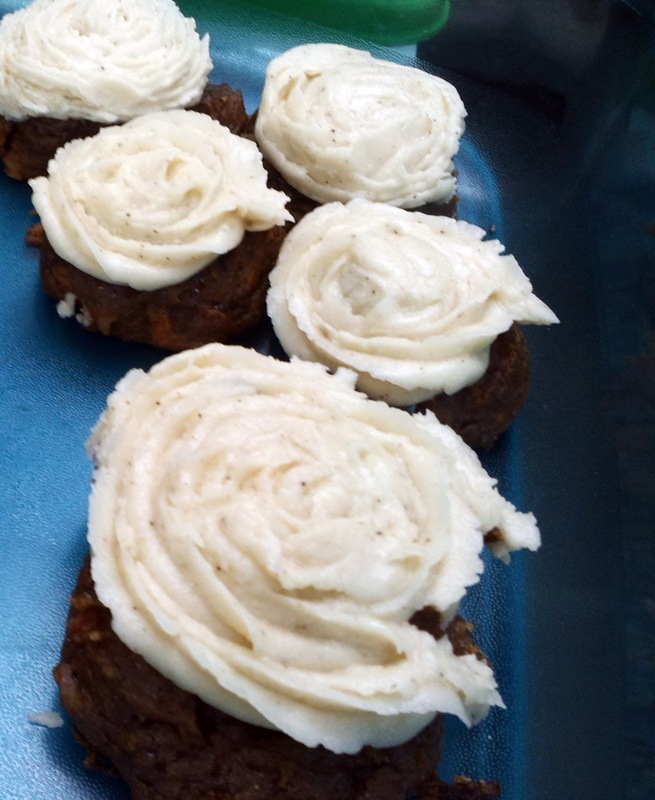 The brown butter icing was my first attempt at homemade frosting and it was delicious. I almost enjoyed the icing more than the cookie, but that's how I roll. Mix together the canned pumpkin and carrot cake mix. My recipe called for hydrating the raisins and carrots in hot water, which I did, but with less water. I made several sizes of cookies from one to three Tablespoons. The two-Tablespoon size cookies were the best, but go with what your heart desires. The cookies don't spread much in the oven, so you can fit at least a dozen on each cookie sheet. Bake in a 375-degree oven for 20ish minutes or until set throughout. Remove and allow to cool completely. Meanwhile, place the butter in a saucepan and melt over medium heat. Once it melts, continue to swirl the butter over the heat until it just starts to brown. Remove from the heat immediately and allow to cool. Pour the cooled brown butter into the work bowl of a stand mixer. Add the vanilla and the sugar. Using the whisk attachment, set the mixer on medium and beat until smooth. Add milk as needed until the icing is smooth. Frost the cookies and consume within two days. I thought only my mom made browned butter frosting!